Design Thinking is a process that is intended to drive innovation by disrupting normal thinking. This disruptive process aligns cross-functional groups, promotes creativity and new ideas, reinforces an openness to testing (and failing), and errors on the side of speed. The whole concept of design thinking is intended to move companies from the mass-production era of making products to the customer experience era of personalization and multi-channel journeys. 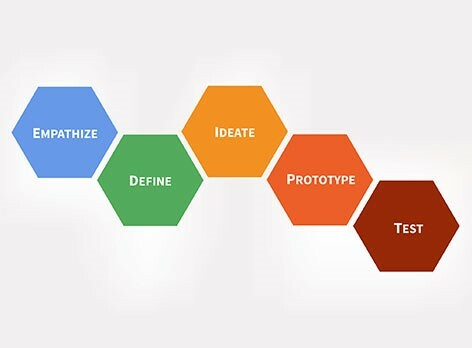 With these attributes in mind, it is no surprise that design thinking has been at the forefront of digital initiatives in recent years. Design thinking has become pervasive across enterprises in recent years because now corporate objectives all sit at the intersection of business and technology. Aside from the correlation of digital trends and corporate objectives, look no farther than the acquisition trends for further proof of design thinking adoption- Genpact bought TandemSeven, Deloitte acquired Doblin, Accenture acquired Fjord, and McKinsey acquired Lunar. The customer experience is at the core of these objectives. Gartner (IT) defines customer experience management (CEM) as “the practice of designing and reacting to customer interactions to meet or exceed customer expectations and, thus, increase customer satisfaction, loyalty and advocacy.” Because digital transformation programs are so strongly associated with customer experience initiatives, we have neglected other areas of our business where applying design thinking principles more consistently would lead to positive results in innovation, alignment, and continuous improvement. After all, aren’t all initiatives customer experience initiatives nowadays? So how does this apply to the world of RPA and Intelligent Process Automation? Isn’t design thinking for modern, customer-facing projects? Doesn’t process automation reside in the back office? The answer is simple: THERE IS ONLY ONE OFFICE NOW! The ‘Digital OneOffice’ concept coined by the folks at HfS Research embodies the ‘customer-first mentality’ regardless of whether that customer is external, internal, or a partner. Phil Fersht from HfS states that a OneOffice operations is an environment “where automation is completely native and decisions can be made by predicting events, not merely reacting to historical data archives.” This is necessary if organizations want to take advantage of the opportunity to break down barriers within our operations. 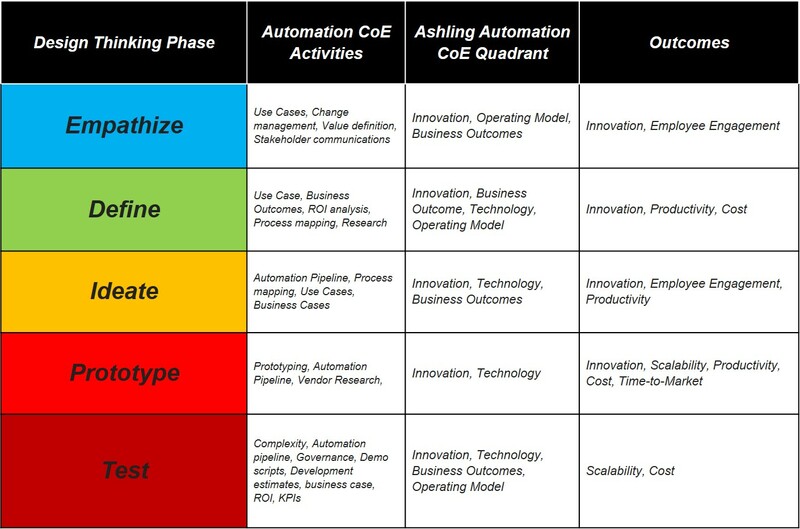 Process Automation is not always directly associated with digital transformation, although that is beginning to change. We believe that process automation is the critical first step of instilling a digital core into a company’s foundation. An end-to-end business process transcends the boundaries previously defined between back and front offices. Think of the simple process of Lead Capture-to-Opportunity-to-Order-to-Cash. Business process re-engineering has been around for decades, but traditionally we would have only looked at the Order-to-Cash process as part of business process re-design. Guess who doesn’t care about your company’s delineation of back-office and front-office? YOUR CUSTOMER! Recent technology advancements with RPA and other intelligent process automation solutions are giving companies the ability to deliver on promised results of process re-design initiatives. The key is to connect these tangible results with the ‘digital era’ principles to ensure creativity, collaboration, and empathy are a part of the process. We are still in the ‘Automation POC’ era. We have seen the evidence that this technology provides capabilities that will revolutionize the way we work in the future, and that RPA use cases are being developed every day. Don Sweeny eloquently discussed a practical example around expense management between Oracle Cloud and UIPath in an earlier blog. But, we are just entering the ‘Automation Scalability’ era. 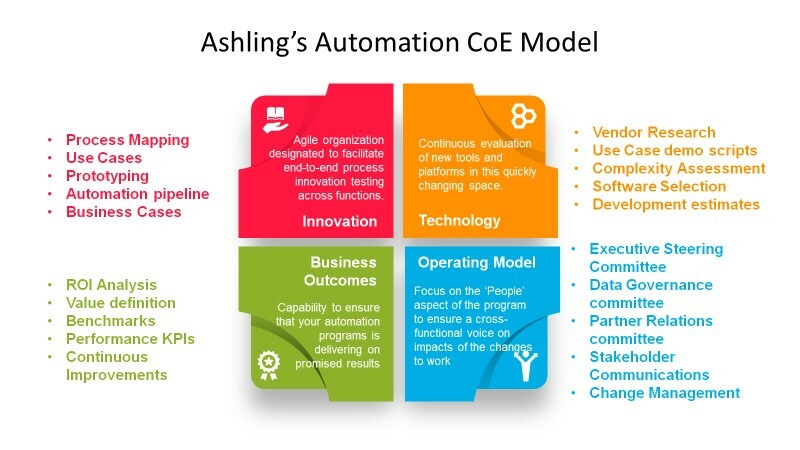 Next up from Ashling Partner Insights: Web-series on 'Industry-specific RPA use cases' & 'Moving from Automation POC to Automation Scalability'.